Last weekend, almost 82,000 were at Wembley to see England host Malta in a World Cup qualifier – their first home match after flopping at Euro 2016. In the same week 30 years ago, England were playing their first home game after reaching the quarter-finals at the 1986 World Cup in Mexico. It carried the added ingredient of being a European Championship qualifier against fellow UK opposition in Northern Ireland, who had also been present at the World Cup finals. And yet the turnout was a mere 35,304, even though it was not being screened live on television. Such was the way of life in the mid-1980s, as football lacked the pulling power of both before and since. But those who did pass through the Wembley turnstiles were rewarded as they saw a moment of magic from Gary Lineker. 1986 had certainly been a year to remember for Lineker. Despite Everton narrowly missing out on major honours in the 1985-86 season, Lineker won a series of personal accolades including being the PFA and Football Writers’ Association player of the year and First Division top scorer. He followed it up by winning the Golden Boot at the 1986 World Cup, memorably scoring six times for England in the tournament. And then he made a big-money move to Barcelona, his status as a star name in European football continually growing. On October 15 he was back in England, turning out at Wembley for the first time since he had scored for Everton in their FA Cup final defeat by Liverpool in May. The trophies were piling up for Gary Lineker in 1986. When Northern Ireland had last visited Wembley 11 months earlier, they ground out the 0-0 draw they needed to join England at the 1986 World Cup in Mexico. But their hero from that night was no longer on the scene, veteran goalkeeper Pat Jennings having retired after the finals. He was proving pretty irreplaceable, manager Billy Bingham – who in a curious move got married on the day of this qualifier – having to select uncapped Phil Hughes of Third Division Bury between the sticks. Bingham was facing a rebuilding exercise, with some of the old favourites no longer involved and veteran Sammy McIlroy dropped to the bench. Every member of the England starting XI had been to the World Cup except Dave Watson, although Viv Anderson had not played any matches and captain Bryan Robson’s tournament was blighted by injury. Headlines were being made by Ray Wilkins being axed from the side, not even making it onto the substitute’s bench. Just one more cap would follow for the midfielder, his international career never really recovering from his dismissal against Morocco at the 1986 World Cup. 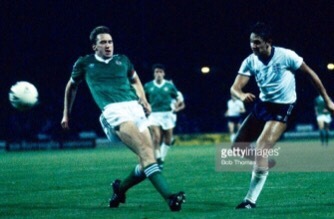 Gary Lineker chips home England’s third against Northern Ireland. With 33 minutes gone, England made the vital breakthrough. Lineker showed his trademark potency from close range as he was on hand to score from the edge of the six-yard box following a corner. But England were unable to build on their lead until 15 minutes from the end, Chris Waddle converting after Peter Beardsley’s effort was deflected into his path. England could now relax and five minutes later came the match’s defining moment. As was often the case during his England career, Lineker found Beardsley to be the ideal partner up front. It had been a goal that went against the stereotypes, with Hoddle doing the dirty work to break up the play and Lineker scoring in style from distance rather than close range. It also wrapped up a decent victory for England. The 3-0 win represented a good start to Euro ’88 qualifying for Bobby Robson’s men. But Lineker was dominating the headlines, particularly as Robson was absolutely brimming with delight about what the player was producing. “He’s possibly just about the greatest striker in the world today. [Diego] Maradona is a wonderfully gifted player with dribbling ability, but would he score more goals?” he asked rhetorically. Robson was also full of praise about Lineker’s superb goal. “I said to Gary ‘what a great goal to score at Wembley, son. I envy you’,” he excitedly told the media. Bingham, whose wedding night had not exactly gone to plan, was graciously full of praise for the England striker when quizzed afterwards. “I think Lineker is superb. He has ability and if he gets the service he is lethal. He has that killer instinct,” said Bingham, who no doubt wished the player was Northern Irish. Lineker failed to score when England beat Yugoslavia the following month, but in February 1987 he famously netted four times as England beat Spain 4-2 in Madrid. The player’s reputation was growing all the time and a hat-trick against Turkey in October 1987 moved England to the brink of Euro ’88 qualification. The 3-0 home victory over Northern Ireland would rarely be recalled except for one moment – Lineker’s delightful finish, one that was so different to his stereotypical close range finishing. As Lineker himself reflected afterwards: “Most of mine come from inside the six-yard box so naturally I’m delighted.” Most of the small crowd at Wembley that night 30 years ago shared the delight too.